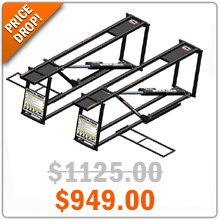 This may be your last chance to purchase the 3,500lb capacity QuickJack! This model is being discontinued, so if you need one, get it now and enjoy the discounted price of just $949 (originally $1,125!) this week. Add to that the FREE ground shipping in the US and you will save hundreds with this purchase! The word is out that QuickJack is the easiest and most convenient product to use when raising your car off the ground so take advantage of this last chance offer before these run out!